A musician who challenged herself to play a ukulele concert on every day of the year is nearing her goal. Eilidh MacAskill has crossed the globe to play gigs and won fans around the world while carrying out her quest. 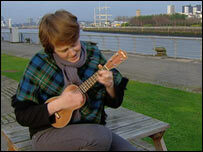 The 27-year-old, from Glasgow, has played venues in New York, Nova Scotia and at the Edinburgh festival. Some of her performances were notched up in her living room, where the audience consisted of her pet cat - who does not like ukulele music. Ms MacAskill's quest began as an aspiration to do something creative every day in 2007, and began to gather steam following an impromptu ceilidh in Glasgow's Kelvingrove Park in the early hours of 1 January. Since then, she has received many messages of support through her internet site for her performances - a mix of her own compositions and covers. "I just wanted to do something that could be light hearted and could be accessible for people," she said. "The idea is that I can go anywhere and almost ask people if they want to see a performance or get them involved in something. "Quite often people are quite wary of that sort of thing, so I wanted something that would be a bit of a joke and people wouldn't be too scared of it." The ukulele, which looks like a small guitar, has grown in popularity over the years - largely due to the support it received from ex-Beatle George Harrison and, more recently, former Smiths guitarist Johnny Marr. BBC reporter and musician David Allison said of the versatile instrument: "It is portable and is basically like a guitar, minus a couple of strings, so you can, if you are a guitarist, keep up to speed. "You can play all kinds of tunes on it, despite the fact it's this tiny wee instrument." Ms MacAskill, a self-taught ukulele player who ran an experimental theatre company after studying theatre at college, is planning to round off the year-long project by playing the venue where her quest began.